Oil prices have now almost halved in six months to below $60/barrel thanks to OPEC’s refusal to cut production. This means all the member countries are revising their government spending policies. 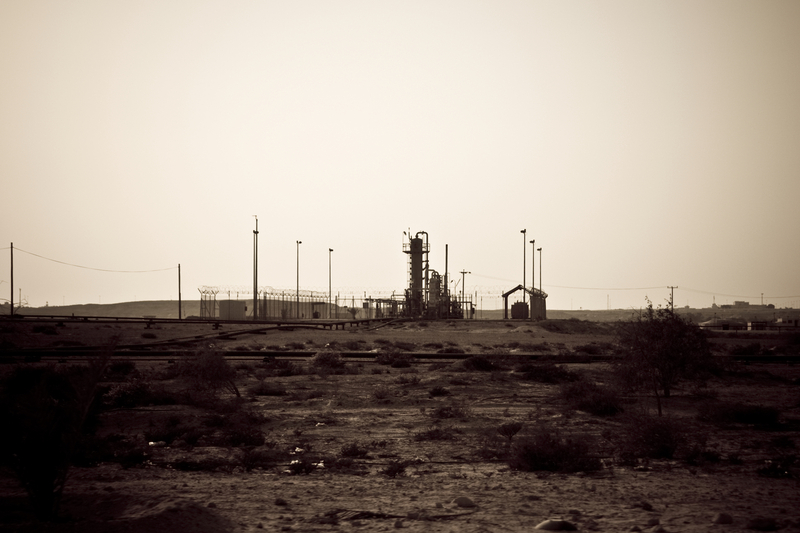 While countries such as Iran and Venezuela face an imminent fiscal crisis, the short-term ramifications for the Arabian peninsula’s oil monarchies are less dramatic. In the long run, however, their very high dependence on oil poses a more fundamental challenge than for almost any of their rivals. The large Gulf hydrocarbons producers – Kuwait, Qatar, Saudi Arabia and the United Arab Emirates (UAE) – have recorded substantial fiscal surpluses for 2014, benefiting from high oil prices earlier in the year. 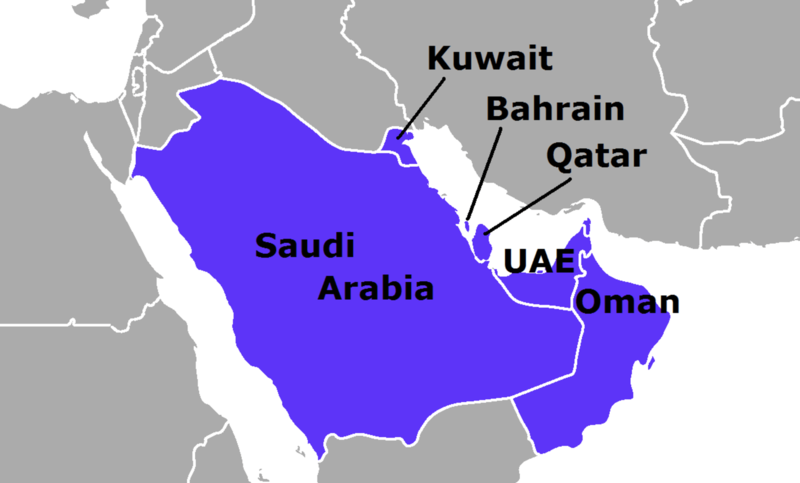 Among these countries of the Gulf Cooperation Council (GCC), Bahrain alone has incurred a substantial deficit. Yet there is trouble building up for the future: the oil prices at which government budgets break even have on average increased by more than three times since the early 2000s as spending commitments have risen. According to IMF estimates, break-even now lies above current oil prices for Bahrain, Oman, Saudi Arabia and the UAE, with even Kuwait and Qatar now touching it at the current price. Saudi Arabia, UAE, Kuwait and Qatar have substantial overseas reserves that are equivalent to several annual budgets, giving them considerable leeway to incur deficits without debt. Bahrain and Oman, both of whom have only small overseas reserves, have less room for fiscal manoeuvre. Bahrain in particular already has government debt of more than 40% of GDP. It has already taken some austerity measures, being the only country among the group in which estimated 2013 spending lay below that for 2012. Yet governments across the region are well aware that the rapid spending growth of the last decade cannot continue. This approach could see financial reserves exhausted within as little as a decade in the case of Saudi Arabia and between one and two decades for the others. The last period of low oil prices and fiscal austerity lasted from the mid-1980s to the late 1990s. Gulf governments generally cut project and infrastructure spending first, protecting government salaries and public services such as education and health as long as possible. State employment was not only protected but continued to grow. Saudi Arabia almost completely abandoned capital expenditure in the 1990s, leading to a decay in public infrastructure that was only addressed during the oil boom in the 2000s. Subsidies followed the same pattern. Budgets for industrial loans were squeezed and utility tariffs for industrial users increased, while subsidies for households remained protected – or tariff increases only targeted larger (and richer) households. To take another Saudi example, the national airline increased ticket prices for business and first class in the early 1990s but protected subsidised prices for economy travellers. This climate was hard on manufacturers but contractors were the worst affected, rendering tens of thousands bankrupt. The lesson? Mass entitlements to employment, services and subsidies are more politically sensitive than other forms of spending. The basic parameters of Gulf policies have not shifted since. If anything, popular entitlements have become stronger and citizens have become better organised in claiming them – unlike political dissent, public and private protests in favour of salary increases and state employment or against subsidy reforms are generally tolerated and often effective. Private business by contrast has come under increasing public pressure for failing to provide sufficient jobs for nationals, hence once again making it likely to be the first target of fiscal trimming. Even if oil prices recover, the situation looks like this: current spending will have to keep rising to accommodate the growing number of working-age citizens, many of whom will continue to be employed in government. 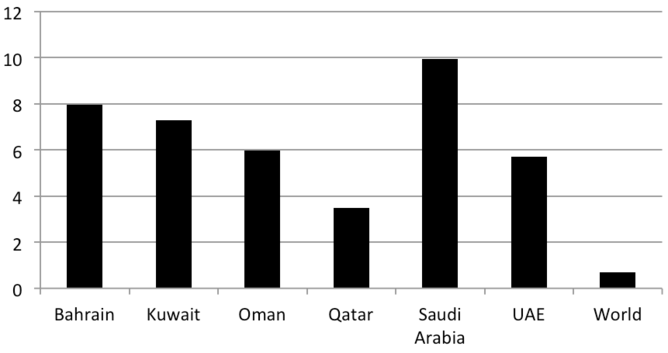 Expenditure might also have to rise to keep the lid on Arab Spring-style political crises. All this means capital expenditure will have to fall. This might force governments to downsize or even stop some large-scale projects, including some of the infrastructure planned for the 2022 World Cup in Qatar. In the long-run, there is a danger of even essential infrastructure spending being squeezed, as was the case in the less wealthy Gulf countries in the 1990s. This in turn could compromise the region’s strategy of diversification to reduce dependency on oil, which has targeted everything from petrochemicals and mining to aviation and tourism. Because the Gulf economies depend particularly heavily on state spending, these reductions will affect economic growth. In the short run, this will mostly impact economic sectors depending on state project spending. In the mid to long-term high break-even prices, locked in through creeping increases in current spending, could make for endemic deficits. In this situation, even current spending would need to plateau and potentially decline to balance the books, meaning stagnation also in the consumer economy. Like in the 1990s, the falling oil price has prompted signs of a renewed reform debate. Even in Kuwait, generally the region’s reform laggard, the government is now openly debating the need for fiscal reforms. One necessary reform is to reduce the subsidies to domestic energy. Energy prices are uniquely low by global comparison, which leads to large-scale over-consumption. Abu Dhabi increased electricity and water tariffs last November, albeit foreign residents bore the brunt. Another option will be to privatise non-essential public assets, which is already being planned in Oman. The drawback is that stock-market valuations are likely to be depressed exactly when the proceeds would be needed the most. Public companies in aviation, heavy industry, telecoms and banking have also been core tools in the GCC’s diversification strategy, so the rulers will be reluctant to sell them. 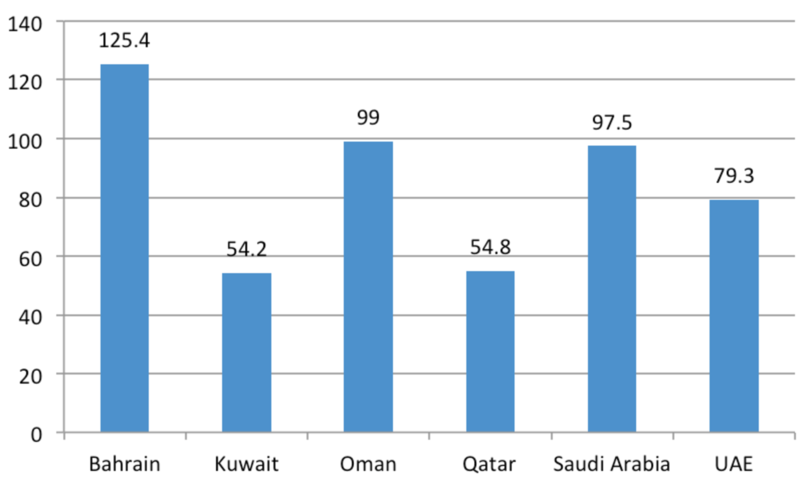 The Gulf countries are also likely to increase the pressure on the private sector to employ more citizens. This will be difficult to implement, however, while local labour markets remain open for low-cost immigrant labour – a core plank of the Gulf economic model. Though the IMF has been saying that Gulf countries need to become less dependent on petroleum for public spending for the past 30 years, taxation remains a political anathema. No government managed to introduce any substantial tax reforms during the 1990s austerity era. A plan for a GCC-wide value-added tax remains on ice despite years of debate. A modern tax system takes a long time to build. And since these economies are so dependent on state spending, it is not clear to what extent the private sector has the capacity to generate revenue on its own anyway. As important, introducing broad-based taxes is likely to give rise to political claims on the part of business and general population that the Gulf rulers would try to avoid until it was too late. In sum, the current oil price drop does not pose an immediate threat to the stability of the Gulf. Even in the case of Bahrain and Oman, their richer neighbours could prevent a politically undesirable economic collapse through grants and loans. And when their overseas reserves are exhausted, they will still be able to delay the inevitable by issuing debt that they can strong-arm local banks to accept. Yet eventually state spending and economic growth will slow and even reverse. The focus of policy will gradually shift towards more painful but necessary reforms, which could nevertheless be too little too late to stave off a fiscal crisis. And as reality finally begins to catch up with this part of the world, its regional and global power looks likely to decline.